What information should you put on your luggage tag? Are you looking for luggage tags? Definition: the act of defining, or of making something definite, distinct, or clear. 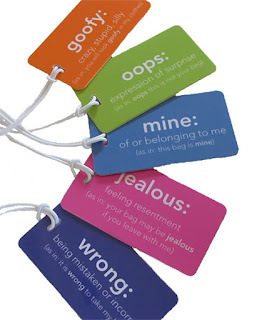 With Inventive Travelware's definitions luggage tags it will be very clear to all which bag is yours. You can have some fun while traveling with these humorous, clever bag tags. Six funny styles offered in a variety of stand out colors. Quickly spot your bag on the luggage carousel with a definition luggage tag attached. As a special bonus - expect to have some fun, interesting conversations! Each tag has a clear window on the back with a removable ID information card. A standard size business card will fit in the window. To keep your information private, simply place the card information side down in the window. An attachment loop is included. With the holidays approaching - check out the entire collection of Inventive Travelware travel tags for your entire list. Do you know your travel rights? Did you know that if your bag is lost by an airline the maximum reimbursement for domestic flights is $2500. Read about more Air Travel Rights ~ https://www.tripsavvy.com/air-travel-rights-you-di...It doesn't hurt to show your appreciation for the hardworking baggage handlers with Inventive Travelware's I Love Baggage Handlers Luggage Tags - lots of great colors available! Are you an aspiring travel writer?